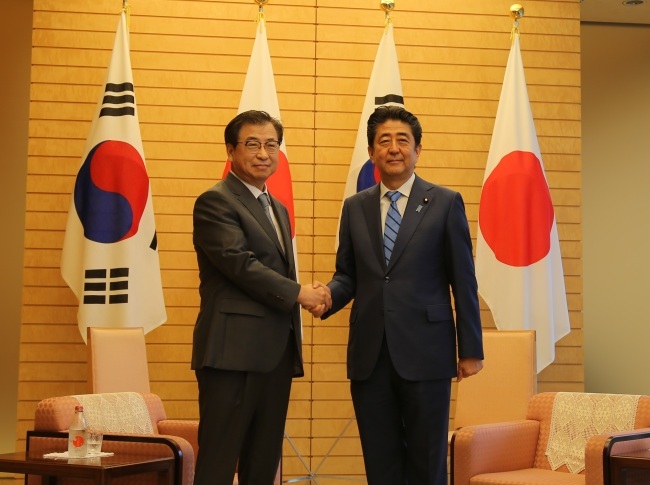 TOKYO -- The head of South Korea's state intelligence agency on Monday briefed Japanese Prime Minister Shinzo Abe on the results of a South Korean presidential delegation's trip to Pyongyang last week. Suh Hoon, director of the National Intelligence Agency and a member of the delegation, arrived in Tokyo on Sunday. At the outset of the meeting, Abe expressed his gratitude for a quick briefing on the issue. "This is a good opportunity to let the world know that Japan-South Korea relations have become so close since the launch of the Moon Jae-in administration," the prime minister said via a translator. The NIS chief said Moon believes the Japanese leader's role is more important than at any other time in denuclearizing the North and establishing a peace regime. "In that sense, (Moon) thinks communication and cooperation between South Korea and Japan should be strengthened," Suh added. He also delivered Moon's consolation message for Japanese people suffering typhoon and quake damages. Suh's visit here is part of Seoul's efforts to elicit cooperation from regional powers on its approach toward Pyongyang. National Security Advisor Chung Eui-yong, who led the delegation, made a separate trip to Beijing over the weekend to brief top Chinese officials on the matter. The envoys sat down with the North's leader Kim Jong-un. Kim reaffirmed his denuclearization commitment and trust in US President Donald Trump, according to the envoys. He agreed to hold his third summit with Moon in Pyongyang next week. The NIS director has served as Moon's key messenger to Japan on the North Korea issue. Shortly after traveling to Pyongyang in March, he briefed Abe in Tokyo as well.